PARK SLOPE — Can you guess the capital of Angola — while taking a shot of whiskey? Dozens of New York bars are home to popular trivia nights that transform the pubs into quizmaster dens with beer, free shots and a challenging general knowledge test. “We’ve always been huge fans of trivia,” said John Rauschenberg, co-owner of Pacific Standard, a Park Slope bar that’s hosted its popular quiz night for seven years. While most bars host mixed-bag rounds or rotating themes, some specialize in book trivia, movies or television shows that attract a die-hard group of fans. “Everyone has their quote-unquote ‘Seinfeld,’” he said. Most trivia nights take place on slow bar nights like Mondays, Tuesdays and Wednesdays to bring in a regular crowd. “It guarantees you’re going to have 30 or 50 or 100 people in your bar every week,” said Tony Hightower, founder of Trivia NYC who hosted his first trivia night almost nine years ago. Hightower and Oliver both take the craft of writing quiz questions seriously. Oliver hosts a monthly bootcamp for potential quizmasters in which he teaches them how to host and how to write questions that are challenging and un-Googleable. "There's a skill to it, but it's a trick you can learn," Hightower said of writing quiz questions. In the last few years, trivia nights have started to attract a regular group of drinkers to bars. They’re also a great conversation starter for friends and colleagues who tend to talk about work or the weather during happy hour, Hightower said. Here are some of the city's trivia nights with a few upcoming theme-nights. Park Slope has plenty of trivia nights but Pacific Standard is “the hardest trivia night around,” said co-owner John Rauschenberg. Themes change every week on Sundays from 8 p.m. to about 10 p.m. and have included sports, television shows, movies and geography. Players can be individuals or teams of a maximum of six people and they have a chance to win free drinks and bar tabs. Alligator Lounge is probably best known for its free pizza but Trivia Dispute hosts a weekly trivia session on Monday nights at 9 p.m.
Trivia host Adam Kesner hosts five rounds of questions with quirky themes like original versions of famous cover songs or quotes or “Elves,” where questions range from "Lord of the Rings" factoids to Will Ferrell’s movie. Prizes include $45 bar tabs, “pulls” from a mystery grab bag and free whiskey shots in between rounds. Trivia NYC, which hosts the quiz night, turns Whole Foods' rooftop bar into an “artisanal quiz house” on Wednesday nights at 7:30 p.m. Individuals or teams of up to six players can win books, theater tickets, gift certificates and more. This Bed-Stuy eatery hosts a general trivia night with four rounds of questions on Wednesday nights at 8 p.m.
Up to four players per team can win prizes, including bar tabs. Lock Yard gets “completely packed out” on its trivia nights on Wednesday from 7:30-9:30 p.m., a manager said. The bar has a regular group of players who participate in a six-month league but players are welcome to walk in for a night of drinks and general knowledge. Themes change every week but have included sports, movies or specific topics like “Night at the Museum,” which included questions on the Ben Stiller movie and museums in general. If "Duff" beer and doughnuts are always on your mind, Berry Park’s monthly “The Simpsons” trivia night is calling your name. Questions focus on the long-running show’s 90s episodes and three episodes will be shown on a big screen. The quiz takes place on the first Thursday of every month from 7 p.m. to about 11:45 p.m. Pay $10 per team with a maximum of six players per team. Individuals play for $5. Trivia NYC hosts Snowdonia’s Sunday night session starts at 7:30 p.m. with rounds like “On This Day In History” and audio questions. Teams of up to five players are welcome and there’s no cover charge. Prizes include books, tickets and drinks. Astoria Tavern hosts a trivia night on Tuesday at 8 p.m. There’s a $10 entry fee per team but winner takes all. 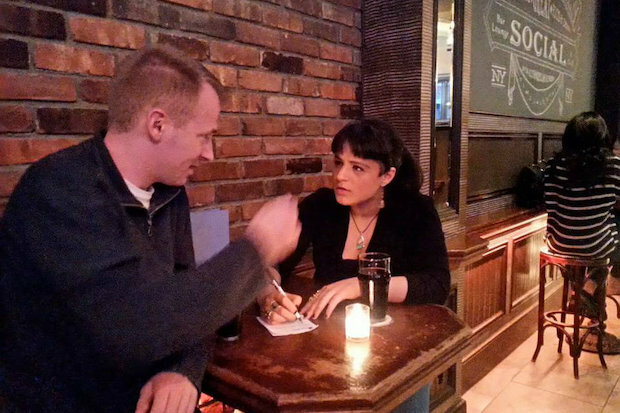 For a sampling of questions from Astoria Tavern’s quiz, check out the Quiz Masters’ blog. On Dec. 19, Alewife is teaming up with amNewYork and NYC Trivia League for a “Pub Quiz Championship” from 7 to 10 p.m. Teams of no more than six could walk away with a $250 winning prize package, according to its website. To register, click here. Alewife also hosts a weekly trivia night on Tuesdays at 8 p.m. and hands out gift vouchers to winners. Sunswick’s weekly trivia night takes place on Wednesday from 8 to 10 p.m. Themes change regularly and might even be topical, like the MLB’s World Series. Teams of up to four players can win free drinks and gifts from sponsoring breweries. Flagship Brewing Company recently opened on Staten Island this year as the first craft brewery in the borough. The beer masters host their trivia nights during the week, usually on Thursday and Friday, starting at 9 p.m. in the taproom. For upcoming events, check their Facebook page. The mixed-bag trivia night, hosted by “Geeks Who Drink,” takes place on Wednesdays at 8 p.m. The quiz is “fast-paced with multimedia elements,” according to previous reports and teams of up to six players should sign up by 8 p.m. each night. Players have a chance to win cash prizes at 120 Bay Café’s Sunday general trivia at 9 p.m. Teams or individuals can enter with $5 and the bar matches the pot, which goes to the winner. Do you know the material of the sweater that George Costanza buys in the episode “The Red Dot”? Hosted by Trivia, AD, Liberty Tavern’s “A Seinfeld Trivia Extravaganza and Airing of Grievances” night will take place on Dec. 18 from 8 p.m. to about 9:30 p.m. To RSVP for the event, visit this website. Charlie’s Bar and Kitchen hosts its trivia night on Wednesday around 8 p.m. along with a $10 burger and beer special. Players could win a $50 bar tab. Every Sunday night at 9 p.m., the top two winning trivia teams have a chance to win up to $50 in gift certificates. Individuals or teams of up to six people can play. The Bronx Beer Hall, located in the Arthur Avenue Retail Market, hosts its trivia night by Trivia Tryst on Wednesday from 8 to 10 p.m. Players can win up to $50 in food and drink in teams of up to six people. This well-known Inwood spot takes its trivia seriously with a website that documents weekly standings and hints for the week. The trivia night takes place every Wednesday at 8 p.m. Entry is free and some of the prizes include T-shirts, glasses, gift certificates and beer, according to the website. The Gael Pub has hosted its popular trivia night for years. Every Tuesday at 8:30 p.m., players have a chance to win books, tickets, free shots after each round and $100 for first place. Teams of up to six players each. Every Tuesday night beginning at 7 p.m., Murphy’s Tavern hosts its mixed-bag trivia night with questions from Trivia NYC. There’s no cover charge but a maximum of up to five players per team. Happy hour specials start at 4 p.m.
A night that’s guaranteed to be “legen – wait for it – dary,” McGee’s Pub will host a “How I Met Your Mother” trivia night on Dec. 30 from 8 to 9:30 p.m.
Bring a bit of magic into the holiday season with a “Harry Potter”-themed quiz from Slattery’s Midtown Pub on Dec. 22 from 8 to 9:30 p.m. The night will include five rounds of wizarding trivia, hosted by Trivia, AD. To reserve a spot for the event, visit this website. Social Bar in Midtown West hosts its trivia night every Monday at 7 p.m. Teams of up to six players can take part in the evening for a chance to win prizes like $25 off your bar tab. Social Bar recommends calling ahead and reserving a table at 212-459-0643.